The MWN-USB54G complies with 802.11g, and 802.11b standards. This adapter offers wireless transmission rates of up to 54Mbps. 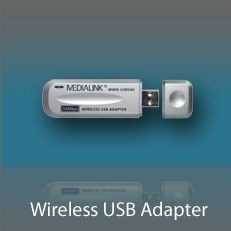 Offering the ultimate in simplified Wi-Fi installation, Medialink adapters are certified by Microsoft to ensure compatibility with Windows 2000/XP/Vista. This certification ensures trouble free compatibility with your operating system. The MWN-USB54G is based on the Ralink RT2500 chipset.